It's nearly been 3 months since I started working out on my home elliptical workout machine. And so far, it's been fairly successful. Though it's been rough at times, especially holidays with changes to my daily routine. I am by no means perfect, but I try and follow the guidelines to stay motivated. When I bought my elliptical, a couple people joked that "the most exercise I'm going to get with it is assembling it". I'm here to prove them wrong! By far the the most effective strategy, following a schedule is the best way to stay motivated. I have scheduled myself to running 30 minutes for 4 days a week (Monday, Wednsday, Friday, Saturday). That way, it's just enough exercise to keep my body in motion throughout the week without unnecessary injuries. It's a no brainer that the less distracting the time of day, the more likely you are to exercise. If I had to make the decision between TV and exercise, I'd choose TV everytime. Therefore, I almost always exercise in the morning when fewer people are awake. This tip has actually bought me back time in my day. Instead of spending 30-40 minutes watching YouTube after work each day, I save the new videos subscriptions for when I workout. The 'Watch Later' feature allows videos to autoplay one after another, which is perfect for less interaction while working out. Plus, it helps that my Schwinn 430 has a rack perfect for smartphones and tablets. Friends can be the best way to stay accountable. Tell your friend, preferrably one that also exercises, about your schedule. Have them check up on you weekly. You should return the favor and check up on your friend too. And if your elliptical doesn't have a rack for your smartphone or tablet or you don't like watching videos, you can always listen to music. The more upbeat rythemic music, the more likely you are to have an effective workout. 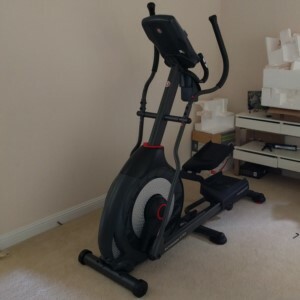 My process of deciding which workout equipment to purchase to begin building a small home gym. All in the name of being healthier!